Everything in my house is organized. Totally and completely organized. The bookcase in the office? Organized. The shelves in the laundry room? Organized. The kitchen cabinets? Yep, you can look there. They're organized (for now). But then there are *dun dun dun* the closets. Closets are a blessing and a curse at the same time. On one hand, they give us a place to store our stuff. On the other hand, they give us a place to store tons of stuff that we don't need and a place to hide it away so we never have to deal with it. My house is about a century old, and it only has four closets. One in each bedroom, and one in the laundry room. Out of those four, I only feel like one of them is functional. The other three? Traps for junk, like things I'm planning to donate or things that just don't have another home. Is this a problem for you, too? 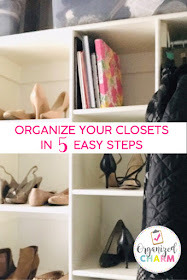 This post can show you how to organize your closets and keep them organized over time! Say hello to the CHARM system! On a piece of paper, write a heading for each closet in your house, even if you feel like it's already being used efficiently. Next, set a timer for a minute and write down how you envision each closet being used. If you need some help, just close your eyes and visualize your perfect life, where everything is clean and everyone is happy. 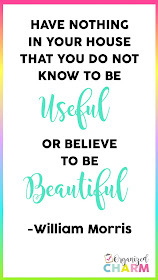 You are totally efficient, look completely fabulous, and everyone in your life is happy. Master Closet: Categorized by clothing type and category. Organized with a chronologically rotating system. Aligns with Stylebook App. Laundry Closet: Holds all cleaning supplies. Also holds unusual items- Halloween costumes, etc. in neat containers. Bin for items to be donated quarterly. Office Closet: Holds outdoorsy stuff, like the stroller, workout equipment. Everything is organized and in its place. Cleaned out every 6 months. My Son's Closet: Out of season clothes kept on the top rack. Shoes on the top rack. Blankets and toys stored on side shelves. Large toys at the bottom. Now that you have that down on paper, think about what daily habits you would need to create to keep your goal a reality. I'm not talking about "Go to Home Depot and buy a shelving system." I'm talking about consistent things like putting your clothes away at the same time of day. 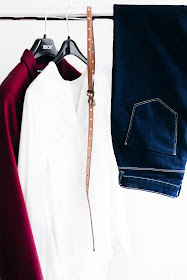 Here are the habits I'll need to get into to keep my closets looking the way I want them. Set your timer for one minute and write down how you see yourself "interacting" with each closet (it sounds crazy, but I promise it works!). -Document everything in Stylebook every day. -When I come home each day, put clothes away immediately- behind other clothes in that category. -Every 3 months, re-evaluate items not worn. -Put items to donate in "Donate" Bin as notice them. -Donate to Junior League every three months. -Keep free of office clutter. This is not a home for old notebooks. -Identify the things you want to keep and create a new home for them. -Put big toys (activity table/balance bike) in here nightly. -Organize his smaller toys by type and in bins on shelves. Now that you've identified your Clear Goal and Target Habits, it's time to take action. This is where you get to run to Home Depot and buy that shelving system! Think about what kinds of containers you want. Don't settle for the first containers you find either, look around and find EXACTLY what you want! The size, the color. What you want exists somewhere, and you won't feel happy with your closet if you use ill-fitting containers. Once you have everything you need, it's time to actually organize the closet! I am a big fan of this and I kind of look forward to doing it. Turn on all the lights in the room where you are working, get some water, play some music, and take every. single. thing. out of your closet. Everything. 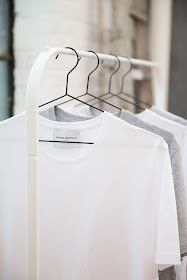 Also Read: 5 Rules for Simplified Style: Get Your Closet Under Control! We dread cleaning out closets because it's work. However, once we've taken everything out, putting things back into the closet becomes the work. You are far less likely to expend energy putting things you don't love back into the closet. 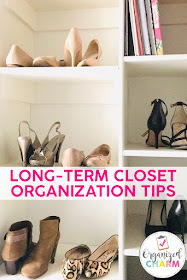 You may even find that you only loved about 20% of the things in your closet, and you were just keeping the rest because you didn't want to go through the work of cleaning it out! So start with the things you love the most. If you were packing to leave town for a hurricane, and you knew there was a chance you might never see some of these things again, what would you choose to take with you? Think with that mentality. No excess. Once you've gotten those things hung back up in your closet, set a limit of some sort. It could be 20 hangers or everything you can fit in one bin. Be ruthless as you slowly decide which things to add back in. And once you've hit your limit, donate the excess that was hiding in your closet! This works for clothes, toys, books, blankets, whatever you're storing in your closets. Most closet organization posts would stop there. You've done the hard work. You've got a nice, clean closet. You're done, right? Look back at your habits. This is the time that you need to use a little discipline and set those habit into motion. One of my habits was to hang up my clothes as soon as I get home. When I get home from work, it's so easy to leave clothes on the floor for "just a few minutes" while I get water, or pick up my son. But when I do that, I'm not respecting the goal that I set for myself. If you tell yourself that you're going to do something, do it. 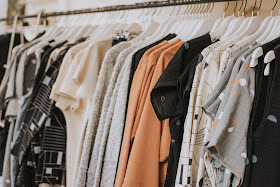 If you let yourself slack off a little here and there, eventually, you'll find yourself right back where you started, being stressed about all the excess junk lurking in your closets. Focus on creating one habit for a month, then another one. Eventually, you'll be able to string your habits together into routines. The routines will keep you from having to have a "closet cleaning" day every year. 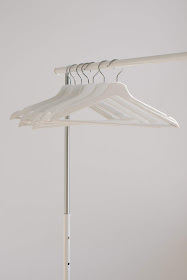 It may seem silly to consciously think about closets, and create habits and routines for them. BUT every little thing we do throughout the day is made up of habits and routines. When we don't put a lot of thought into them, we fall into bad habits or unproductive routines. However, if you DO put thought and purpose into them, you are one step closer to living the dream life that you envisioned! Get into the mindset that you are an organized person, your closets are organized, and you don't bring in clutter. One of the biggest ways we sabotage ourselves is by saying "I'm the most disorganized person ever," or "my house is always a mess." DON'T SAY THAT! When you get down on yourself and your messy house, guess how your house will stay? Messy! Find a relevant quote or two that you really like and think it to yourself when you're looking through your closets. Take the time to put everything back where it's supposed to go. Do it for your future self. Think about how much easier it will be to get ready for work in the morning if you don't have to dig through a dresser drawer for something that wasn't hung up correctly! According to Gresham's Law of Planning, every minute spent planning saves you about 10 minutes in the future. So, even though it may be difficult for me to let my son cry for a minute while I hang up my clothes correctly, that helps me have a more efficient morning (which will lead to me having about 10 minutes to play with him before work)! 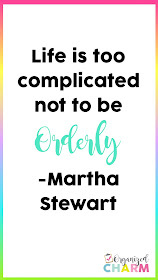 Keep things like this in mind throughout your day! It may be a tiny decision now, but it will help you have a smooth getting ready time in the morning. And isn't that totally worth it?! What systems have you tried to keep your closets clean and organized? How did they work? Share your experiences below!